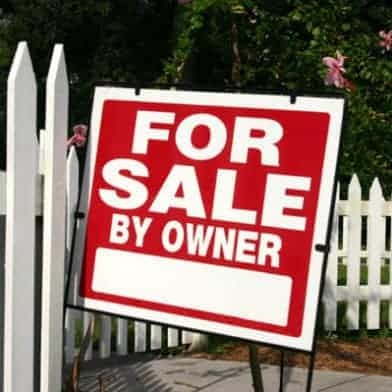 My Building’s For Sale, Should I Worry? Over the weekend I received a letter from a real estate broker informing me that my landlord intends to put the building I’m living in up for sale. I’m currently living in a three unit Victorian in the Lower Haight, and the rent is truly more than reasonable. Because of the great location and the rent I was hoping to hunker down in this place for a few years. I moved in back in November and signed a year lease, which I believe was supposed to go month to month after November 2010. Everyone else in the building has been there for several years so I’m fairly sure they’re already on month to month terms. Now I’ve read up a bit on some of my rights, but I wasn’t really clear on a couple of things. First off I’ve noticed that once the building is sold if the new landlord decides to continue renting the building then my current lease terms will have to be honored. However if they decide to convert the building into condos/tic then I may have the right to relocation benefits. Now what’s not clear to me is how this will all factor in when my year lease would turn into a month to month lease. At that point do these same rights continue to cover me for as long as I wish to stay in the apartment? Would it be possible for the new landlord to just wait out my current lease terms and then refuse to allow me to stay on month to month or renew my lease terms? Really I guess I would just like some clarification as to what my rights are when my lease is scheduled to go month to month. Let’s pick this one apart. Three-unit Victorian in the Lower Haight, obviously built before 1979 and not a single family house. You already know this; your tenancy is completely within the price control and “just cause eviction” parameters of the San Francisco Rent Ordinance. Even if you were living in a brand new SOMA cracker box you would have the same protections until November 2010 because your lease doesn’t expire until then. Many tenants don’t understand the relationship between their lease and San Francisco rent control. Because your building was built before 1979, your tenancy can only be terminated for one of the fifteen “just causes” in the rent ordinance. Even if your lease expires, the landlord can only evict you for cause. Lease expiration is not a just cause under the rent ordinance. Because you live in a building with two or more units, the landlord cannot increase your rent to market rate after the expiration of the lease. Instead, he can only increase the rent using the applicable allowable increase. This year it is .1% (one tenth of one percent). The landlord can require that you sign another one-year lease that includes the applicable increase but the lease must contain the same material terms as the lease you originally signed. Before you hunker down, however, you should understand that three-unit buildings are prime speculator targets. Usually the inflated sales prices do not justify the rental income, so people who purchase small building are often looking to sell units as tenancies in common (TICs). After the building is sold you might be facing several different scenarios. Often a new speculator owner will approach tenants in a small building with an offer to buyout their tenancy. That way he can avoid evicting the tenant for an applicable just cause. For example if the new owner is just a developer who wants to rehab the building and sell it as TICs, it’s going to be tough for him to claim that he wants to evict a tenant to move in, because among other things, he has to promise to live in the unit for three years. For the speculator it may be advantageous to pay you money to waive your tenancy rights and move. For more information about buyouts check out the series of articles I wrote in my blog, Evict This! A new owner may simply want to evict you to move in. If you are served with an OMI (owner move-in) notice you will be entitled to the stautory relocation payment. This year it is $5,101.00 per tenant. Finally, a speculator may want to evict all of the tenants in the building using an Ellis Act eviction. If you are served with an Ellis eviction you’ll be entitled to 120 days to move (unless you’re disabled or over 62 years old) and a relocation payment of slightly more than the $5,101 for other evictions. As you can see there are a lot of “what ifs” involving the sale of a smaller building in San Francisco. These days, given the real estate market and fewer speculator evictions you might just get your wish. Happy hunkering! 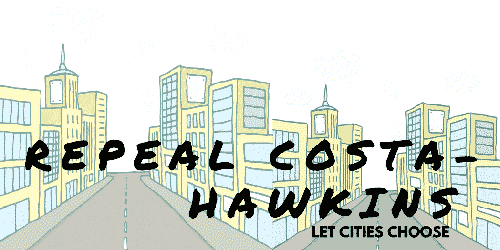 The Costa Hawkins Rent Housing Act, a bi-partisan law enacted in 1995 by the band of pandering griftocrats we call our state legislators, that eviscerated local rent control. Read Evict This! if you’re not angry enough already.